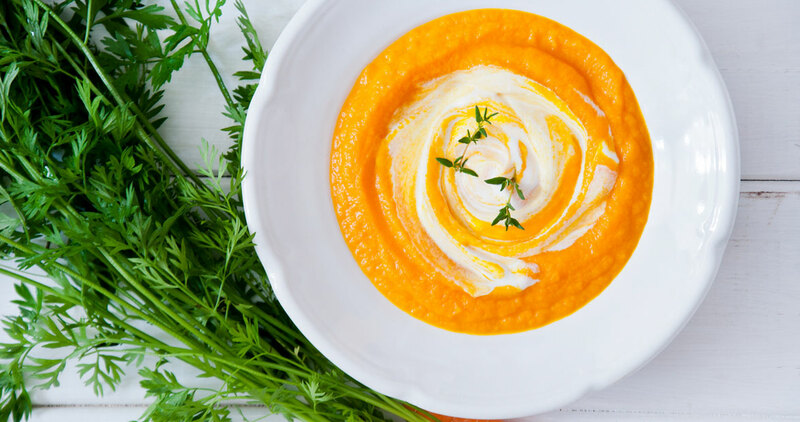 Celebrate warm weather and bright, fresh produce with a pairing as colorful as the season: chilled carrot soup. Preheat oven to 425°. While the oven is heating, line a baking sheet with foil and place it inside. Peel carrots and cut into large, matchstick-size pieces. Place into a bowl with onions and cloves of garlic. Melt 2 tablespoons of coconut oil and drizzle over carrot mixture, tossing to coat. Remove hot baking sheet and pour vegetables onto the pan, spreading out into a single layer. (Vegetables can be cooked ahead of time and refrigerated or frozen for later use.) Roast for about 25 minutes, tossing a couple of times for even cooking. Set aside to cool. Peel ginger and cut it into several pieces. In a heavy-bottomed pot, melt remaining tablespoon of coconut oil over medium-low heat. Add ginger and sauté for about 5 minutes. Add orange juice, increase heat to high, and bring to a boil for 2 minutes. Add broth with a few sprigs of fresh thyme and carrot mixture; bring back to rolling boil for 1 minute. Cover and reduce heat to medium. Continue on low boil for 8-10 minutes. Remove from heat and strain, discarding pieces of ginger and thyme. Season with salt and pepper. Pour into a blender and pulse until the mixture is pureed. Chill for several hours or overnight. In a chilled bowl, whip heavy cream until peaks form. Drizzle in 1 tablespoon of honey and whip just until honey is incorporated. Chill. At serving time, divide chilled soup among bowls. Top with dollop of honey whipped cream. Garnish with fresh thyme and a bit of orange zest.